Good Morning Thunderbirds! It’s here! It’s the actual last day of Wednesday Folders!! Summer is 5 days away!! Even though this is the last official Wednesday folder of the year there will probably be some more posts on the website and Facebook through the end of school and summer – so keep an eye out for them. Have a fantastic summer and see you next year!!! In case you missed the news yesterday, our new principal is Michelle Amezquita Navarro! 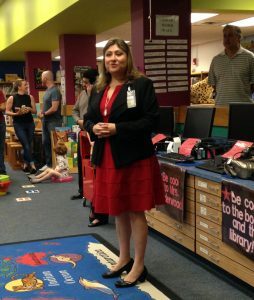 Ms. Navarro was born & raised right here in Austin, going to public school at Sanchez & Graham Elementary, Dobie Middle School, & Reagan High School. She received her undergraduate degree from the University of Texas at Austin & her master’s degree from Concordia. She taught elementary school for 13 years & then moved into administration. She was most recently the Assistant Principal at Oak Hill Elementary. She married her high school sweetheart & they have a 1st grade daughter. Welcome to our Thunderbird Family, Ms. Navarro! Memorial Day Holiday-3 day weekend whoo hoo! Last Day of school is Wednesday May 30th! Lists will be sent home in the Report Cards next week. And we’re going to have an option to purchase school supply sets online – details coming soon. Ms. Underwood has put together some great resources for summer reading. Check out the attached flyer for ways to read and earn free books!!! Check out your new classroom, meet your teacher, drop off school supplies, share a sweet treat, AND purchase the new official 2017/2018 Thunderbird T-shirt! After you drop off your students, please join us for a cup of coffee and a chance to meet other Thunderbird parents. You can still honor Ms. Robertson’s years at THES! The PTA is still collecting money for a gift to the school in honor of Ms. Robertson’s many years of service. The money will go towards an Outdoor Classroom and Butterfly Garden which is being designed and built by some of our very own 4th graders!